While the world's eyes are focused on the Green Lantern live action film starring Ryan Reynolds, Warner Home Video rather quietly released a second movie featuring Hal Jordan and his band of intergalactic super protectors that serves as a great complementary piece, and may even be the better Green Lantern primer. Green Lantern: Emerald Knights is the eleventh entry in the DC Universe Animated Original Movie series, following such top notch adaptations as All Star Superman and Batman: Under The Red Hood. Taking the very best comic book storylines and bringing them over to a movie format presents some unique challenges which is why this anthology compiling five of the best Green Lantern stories ever is an even more daunting undertaking. The five self-contained stories are woven together by an over-arching storyline featuring Hal Jordan (voiced by Nathan Fillion of Castle fame) who gives the young new Green Lantern recruit Arisia (voiced by Elisabeth Moss from Mad Men) a biographical crash-course on some of the more memorable Green Lanterns including Abin Sur, Kilowog, Laira and the living planet Mogo. Each story is written and directed by a different team which gives each piece a distinct tone, but unlike DC Comic's other animated original anthology, Batman: Gotham Knight, ﻿the overall art style stays pretty consistent across stories. The main plot has the evil anti-matter alien tyrant known as Krona threatening to destroy life as we know it, which naturally this draws the attention of the universal peace keeping Green Lantern Corps who show unity in strength as they team to eradicate this menace once and for all. To make matters worse, Krona is fast approaching Oa, the homeworld of Guardians and the Central Battery which powers the Green Lantern rings. Our fearless leader Hal Jordan teams with rookie Arisia Rrab who expresses self-doubt about her ability to ward off this powerful alien life. Hal proceeds to regale about his fellow Green Lantern teammates, telling Arisia that even mighty Lanterns such as Kilowog were once green recruits. Recounting the story of the "The First Lantern," ﻿Hal tells Arisia about the forging of the first four power rings by the Guardians who intend them to go to the bravest candidates in the universe. However, the most unlikely of ringbearer who chosen -- Avra the lowly scribe who has never seen battle before. Avra eventually learns great courage and is the very first Green Lantern to construct objects created by pure willpower. Through more inspirational stories such as Kilowog's first day in Green Lantern training and Laira Omoto's decision to combat her own family to do what's right for her sector, Hal teaches Arisia that a true Green Lantern isn't without fear, but rather has the ability to overcome fear. Each story has its own tone, with some being more action oriented and others more serious emotional pieces. There's even a comedic story called "Mogo Doesn't Socialize" that stars Bolphunga the Unrelenting﻿ who is obsessed with becoming the fiercest warrior in the galaxy. While searching a distant planet for Mogo, whom he hears is the most powerful being in the universe, Bolphunga﻿ soon learns that Mogo is the entire planet, a living world, and sends Bolphunga﻿ running scared. All the stories are richly detailed, with a heavy focus on rich greens and yellows that really create a vibrancy throughout the film. 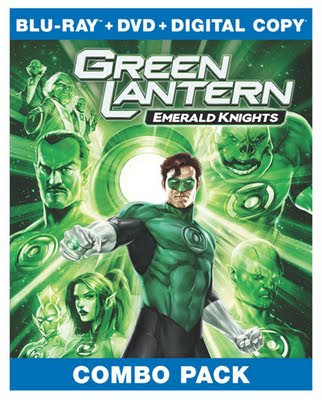 In addition to the superb main movie, Green Lantern: Emerald Knights includes about 75 minutes of bonus material including a sneak peak at Batman: Year One, the next DC Universe Animated Original Movie, a behind-the-scenes look at All Star Superman, the featurette "Only the Bravest: Tales of the Green Lantern Corps" which explores what it means to be brave, and a second featurette called "Why Green Lantern Matters: The Talent of Geoff Johns". There's also a few other bonuses thrown in such as some history lessons on Abin Sur and Laira Omoto, and two hand-picked cartoons from producer Bruce Timm. While not the strongest entry in the DC Universe Animated Original Movie series (that honour still goes to Batman: Under the Red Hood for me), Bruce Timm and his team have created a worthy entry that Green Lantern fans are sure to enjoy.